Widow; born of Christian parents at Tagaste, North Africa, in 333; died at Ostia, near Rome, in 387. We are told but little of her childhood. She was married early in life to Patritius who held an official position in Tagaste. He was a pagan, though like so many at that period, his religion was no more than a name; his temper was violent and he appears to have been of dissolute habits. Consequently Monica's married life was far from being a happy one, more especially as Patritius's mother seems to have been of a like disposition with himself. There was of course a gulf between husband and wife; her almsdeeds and her habits of prayer annoyed him, but it is said that he always held her in a sort of reverence. Monica was not the only matron of Tagaste whose married life was unhappy, but, by her sweetness and patience, she was able to exercise a veritable apostolate amongst the wives and mothers of her native town; they knew that she suffered as they did, and her words and example had a proportionate effect. Three children were born of this marriage, Augustine the eldest, Navigius the second, and a daughter, Perpetua. Monica had been unable to secure baptism for her children, and her grief was great when Augustine fell ill; in her distress she besought Patritius to allow him to be baptized; he agreed, but on the boy's recovery withdrew his consent. All Monica's anxiety now centred in Augustine; he was wayward and, as he himself tells us, lazy. He was sent to Madaura to school and Monica seems to have literally wrestled with God for the soul of her son. A great consolation was vouchsafed her — in compensation perhaps for all that she was to experience through Augustine — Patritius became a Christian. Meanwhile, Augustine had been sent to Carthage, to prosecute his studies, and here he fell into grievous sin. Patritius died very shortly after his reception into the Church and Monica resolved not to marry again. At Carthage Augustine had become a Manichean and when on his return home he ventilated certain heretical propositions she drove him away from her table, but a strange vision which she had urged her to recall him. It was at this time that she went to see a certain holy bishop, whose name is not given, but who consoled her with the now famous words, "the child of those tears shall never perish." 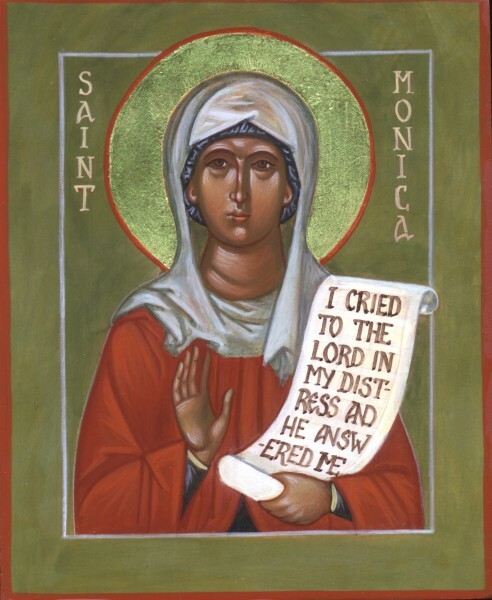 There is no more pathetic story in the annals of the Saints than that of Monica pursuing her wayward son to Rome, wither he had gone by stealth; when she arrived he had already gone to Milan, but she followed him. Here she found St. Ambrose and through him she ultimately had the joy of seeing Augustine yield, after seventeen years of resistance. Mother and son spent six months of true peace at Cassiacum, after which time Augustine was baptized in the church of St. John the Baptist at Milan. Africa claimed them however, and they set out on their journey, stopping at Cività Vecchia and at Ostia. Here death overtook Monica and the finest pages of his "Confessions" were penned as the result of the emotion Augustine then experienced. St. Monica was buried at Ostia, and at first seems to have been almost forgotten, though her body was removed during the sixth century to a hidden crypt in the church of St. Aureus. About the thirteenth century, however, the cult of St. Monica began to spread and a feast in her honour was kept on 4 May. In 1430 Martin V ordered the relics to be brought to Rome. Many miracles occurred on the way, and the cultus of St. Monica was definitely established. Later the Archbishop of Rouen, Cardinal d'Estouteville, built a church at Rome in honour of St. Augustine and deposited the relics of St. Monica in a chapel to the left of the high altar. The Office of St. Monica however does not seem to have found a place in the Roman Breviary before the sixteenth century. In 1850 there was established at Notre Dame de Sion at Paris an Association of Christian mothers under the patronage of St. Monica; its object was mutual prayer for sons and husbands who had gone astray. This Association was in 1856 raised to the rank of an archconfraternity and spread rapidly over all the Catholic world, branches being established in Dublin, London, Liverpool, Sydney, and Buenos Aires. Eugenius IV had established a similar Confraternity long before.